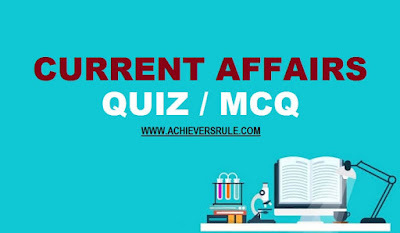 You must solve the Daily Current Affairs MCQ - 23rd December 2017 and get ready to face the upcoming IBPS, SSC exams easily. The Current Affairs Set consists of the questions of latest pattern, answers along with explanations that covers all the latest news updates i.e. sports, awards etc. Q1.The DARPAN Project was launched by whom ? Q2.India has signed an agreement with ____ regarding the information on Black Money . Q3.In which city the 2022 Commonwealth Games would be held ? Q4.Which Bollywood actor/ actress has topped the Forbes India Celebrity 100 List 2017 ? Q5.India would conduct the "Naseeem Al Bagr" exercise with which country ? Q6.Author Mamang Dai has won 2017 Sahitya Academy Award. The award is given to her for which novel ? Q7.In which city the 2017 Regional Conference on "Good Governance and Replication of Best Practices" would be held ? Q8.The first design University of India "World University of Design" has opened in which state ? Q9.The 9th International Youth Sailing Competition would be held in which state of India? Q10.Which of the following is observed as the National Mathematics Day ? Explanation 1. The Minister of Communications Shri Manoj Sinha launched DARPAN – “Digital Advancement of Rural Post Office for A New India” Project to improve the quality of service, add value to services and achieve “financial inclusion” of un-banked rural population. Explanation 2. India has signed an agreement to control black money with Switzerland that would allow automatic sharing of tax-related information from January 1 next year. Explanation 3. Birmingham has been named host city for the 2022 Commonwealth Games - the most expensive sports event to be held in Britain since the London Olympics. Explanation 4. The methodology (see below) for calculating the Forbes India Celebrity 100 List has changed, but its top three names have remained constant. Salman Khan, for the second successive year, is at No 1, despite the subdued box office performance of his film Tubelight. Explanation 5. India and Oman will conduct 10th edition of bilateral maritime exercise 'Naseem Al Bahr' in the Arabian Sea from January 22 to January 27, 2016. Explanation 6. Itanagar-based author and journalist Mamang Dai won the Sahitya Akademi Award for her 2014 novel The Black Hill. Dai, a Padma Shri recipient, was among 24 novelists, poets and short story writers who received the coveted literature award for major Indian languages. Explanation 7. The Department of Administrative Reforms & Public grievances (DARPG ), Ministry of Personnel, Public Grievances & Pensions, Government of India is organising a 2-day Regional Conference on “Good Governance and Replication of Best Practices” on December 22ndand 23rd, 2017 in collaboration with Government of Assam in Guwahati. Explanation 8. India's first and only design university, World University of Deisgn opened it campus at Sonipat, Haryana. Explanation 9. Krishnapatnam Port in Nellore, Andhra Pradesh, is hosting the 9th edition of International Youth Sailing Competition of India from December 27th to December 31st 2017. Explanation 10. National Mathematics Day is being celebrated all across the country on 22 December. The day is celebrated to commemorate the 129th birth anniversary of Indian mathematician Srinivasa Ramanujan.